Public schools are visiting Ken Ham’s Creation Museum. The Creation Museum is open to public school field trips, and the museum’s founder has some thoughts on separation of church and state. 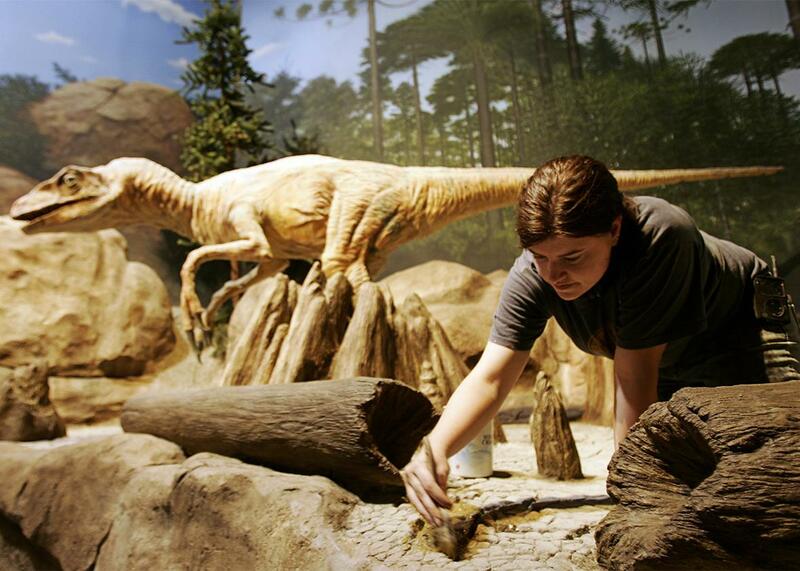 Artist Laura Spence paints next to a mechanical Utahraptor on May 16, 2007, at the Creation Museum in Petersburg, Kentucky. Ken Ham, the Ayatollah of Appalachia and founder of Kentucky’s Creation Museum, is at the pulpit of Covington’s First Baptist Church in Louisiana. He’s railing that young people are “taught not to think” by “secular museums” and schools. Behind Ham, there’s a blown-glass picture of Jesus wreathed in flames. This was the opening session for one of Ham’s Vision conferences, events organized to teach the “scientific” foundations of creationism. This particular gathering includes student breakout sessions for younger Ham fans, like Dinosaurs for Kids (listed as being for students in grades kindergarten through sixth) and Science Confirms the Bible (Grades 7–12). Ham has built a small financial empire out of his $27 million replica Noah’s Ark theme park and the miseducation of children. Titled Genesis and the State of the Culture, this first session laid out the future as Ham sees it, which, in one word, is apocalyptic. Ham had projected a PowerPoint slide on the wall that had a tower built from blocks with the words evolution, abortion, and euthanasia on them standing tall next to the crumbled ruins of words like Bible, morality, and the traditional family. Speaking to 300 people in the church sanctuary, Ham credited evolution education with everything from transgender rights and the end of traditional marriage to the idea that humans are animals. The audience was finishing Ham’s sentences, shouting words like blood and ark back at him. According to Ham, Christians can’t accept evolution because the book of Genesis says man was made in the image of God. “If God used evolution, God came from an ape,” he said. If someone wanted to learn more about how evolution teaches children that humans are immoral apes, she could buy Ham’s book, The Lie: Evolution, for $13 outside of the chapel. Many here did want to know more—the crowd flooded out to buy textbooks from a row of tables that stretched around the entire lobby (a few hundred feet of curriculum materials). I asked Ham if he was aware of the public schools visiting the museum, but he told me the museum didn’t keep track of the groups that came. “A lot of those groups that come, I wouldn’t even know who they are,” he told me. But, again, the museum’s private messaging is a little different from what Ham says in public. I emailed the reservations department at the Creation Museum and asked if the museum had an educational rate for public schools. Cara, a creation museum staffer, told me that school groups get an “educational group rate” and only pay $12.95 per adult ticket (chaperones and students older than 13 years old) as long as the group includes 15 people. Also, “once the requirement of 15 tickets purchased has been reached, we will provide one complimentary chaperone general admission (not including planetarium) ticket for every 10 students,” she said. There are also complimentary tickets and food vouchers for the bus driver. At Ham’s Vision conferences, he’s free to teach children that T. rex was a vegetarian that lived with Adam and Eve. No matter how ludicrous it is, that’s a legitimate exercise of religious freedom. These creationist field trips, however, are not. No matter how steep the discount, public schools can’t afford to miseducate our kids with religious pseudoscience like creationism.